For instance, my experiences motivated me to trust no one, to assume the worst, and to leave people behind when those negative expectations were fulfilled. Of course, with my beliefs coloring my vision of others, and myself, I attracted people with similar beliefs, who of course, did not let me down by treating me with disrespect, disregard, contempt, harm, and even betrayal … all things I carried in my heart and mind, sometimes with awareness, though often not. I would like to tell you that all changed when I examined and changed my beliefs, but there is more truth to my old beliefs than I would like to acknowledge. The thing is, like me for so long, many people do not know what their core beliefs are and even if they are their own, versus other people’s beliefs they adopted through conditioning, peer pressure etc. they don’t yet know the lens can be changed. As a result, they also harbor the notion no one is trustworthy, to expect the worst from people, though they may have their own way of dealing with their fulfilled expectations. My two new beliefs may seem at odds with each other, but in reality they complement each and even support each other. First, based on logic, practicality, and compassion, my new personal philosophy recognizes everyone as valuable … to be respected simply for being a life. I don’t have to agree with them, like them, approve of them, or any other such thing. I live and let live, unless of course they are harming someone, which negates the option to live and let live because they are not giving the same option to those they are harming. Secondly, driven to feel fulfilled beyond my personal philosophy alone, I returned to believing in God, Jesus, and the Holy Spirit. Raised a Catholic, but not without a long time in between to fill in the gaps left by Catholicism teachings, my return was a slow, cautious, meandering one. Exploring other spiritual beliefs, none satisfied and kept me moving on, searching to have the gap filled. Yet even when I accepted God, Jesus, and the Holy Spirit, with my new awareness and educational level, peace did not come right away. My head had to get wrapped around the distinctions between what I learned in my youth was not all the truth and the whole truth, came not from a person, but from the Bible itself. I would like to say other believers drew me back to God, but overall I have discovered the many Christians I have met are struggling to believe and act as the Bible teaches, first and foremost to love unconditionally, and even to respect each other as God’s children. However, this matters not now because one, I choose to respect all people and their right to choose so I live and let live, and two, because I am learning how to love like God, unconditionally, with grace, forgiveness, mercy, and all the things we all hunger for to fill the holes and gaps in our lives. Whatever lens you wear, if they are not allowing you to see the world as it really is, maybe you are due for a new prescription too. We as Canadians, nor anyone else in the world, are immune to the effects of a low “Respect Level” for one’s own and other people’s lives, further demonstrated by the alleged suspect’s request for the police to shoot him in the head (from article). Condolences to all and my prayer that people wake up and realize that stronger laws and hiding won’t solve the problem … a world filled with people with high enough “Respect Levels” will because they will value their own and other people’s lives equally and therefore will not desire to harm and kill … others and then themselves, either directly or as a result of their harm to others. The introduction and study of Alice Miller’s body of work changed and played a big role in healing my life. 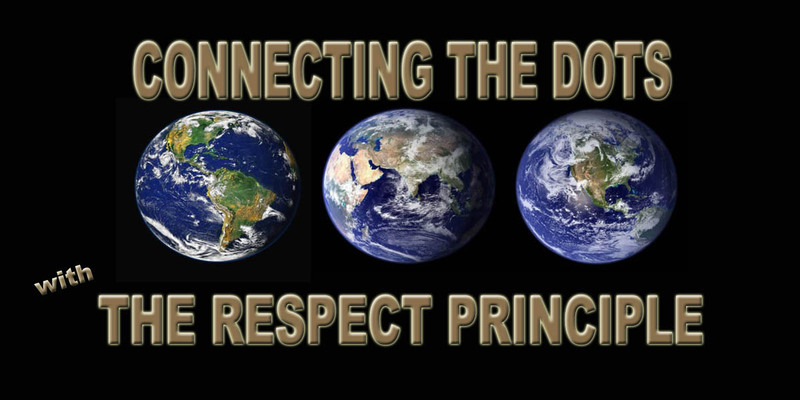 Fueled by my deep compassion for all people, what I learned about respect and love from Alice Miller inspired my development of the Connecting The Dots With The Respect Principle concept, company, books, products, services, and global initiative. My compassion and respect for everyone, plus my understanding of what needs to change in our world drives me every day to keep moving forward with this body of work that will hopefully help many others as Alice helped so many too. One of the most riveting and shocking … plus a perfect example of what the deadly mix of low “Respect Levels,” opportunity, and the wrong people for a job have done … and still do. If we are as smart as we like to think we are, would we be treating each other and our world the way we do considering the consequences our choices make us live with?